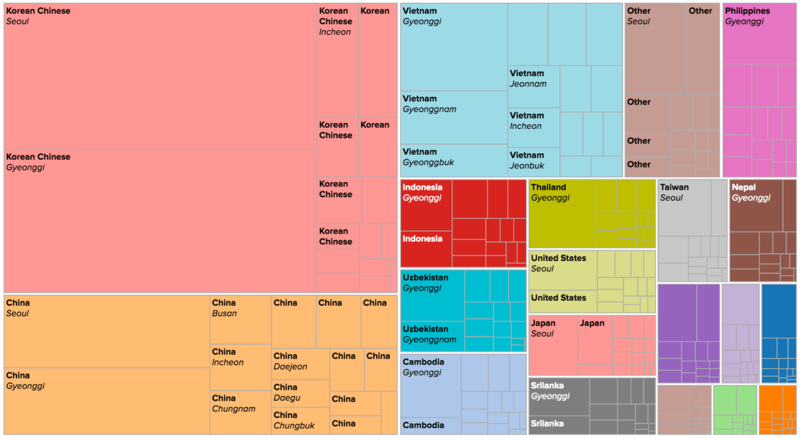 Where are Korea’s Foreigners From? Separating foreigners from the locals at a recent street festival celebrating Buddha’s birthday. I had to move across the globe, but I’ve finally cracked The One Percent. Not in wealth, of course. 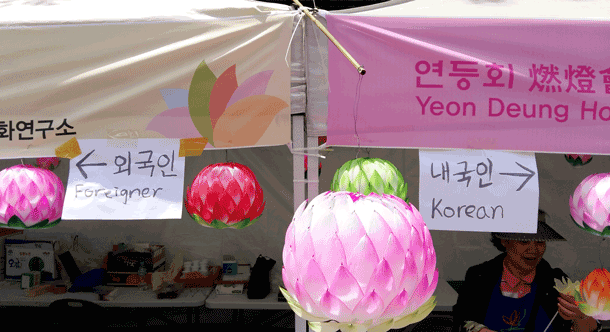 But I am one of about 24,000 civilian Americans living in South Korea, population 50.2 million. So that means I’m quite seriously in the minority. 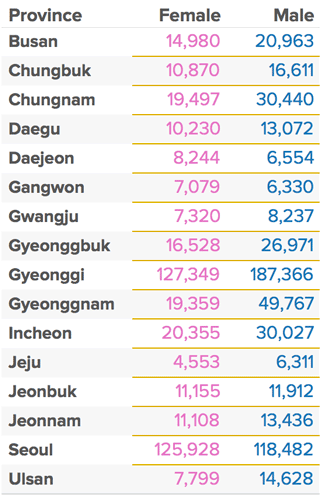 In my central Seoul district, for example, there are about 1,500 registered* Americans** — among 200,000 residents overall. 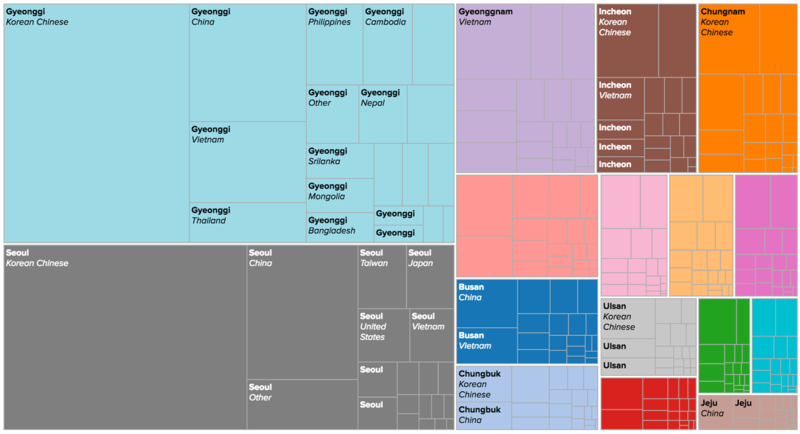 China, by far, sends the most foreigners to South Korea. That’s true for Han Chinese, but also residents who are the decedents of Koreans who at some point received Chinese citizenship. (The Korean peninsula shares a 800-mile border with China). The United States, to my surprise, if pretty far down the list of countries represented by foreign residents here. 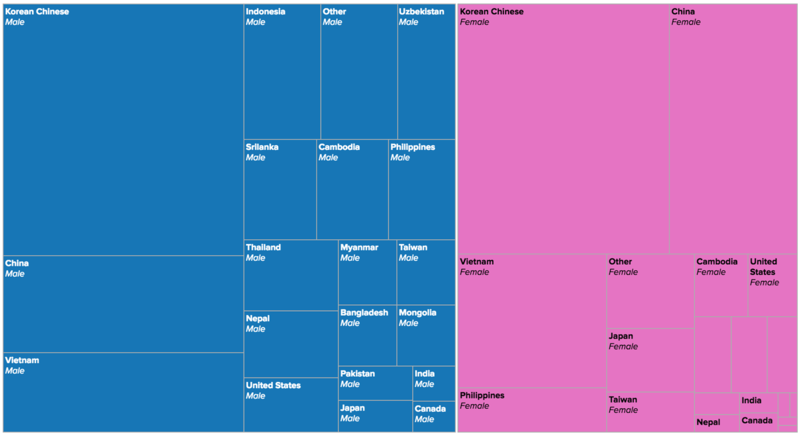 Larger, interactive versions of these treemaps, sketches in Tableau Public, can be viewed here: Gender | Country | Province. They aren’t great on mobile, however. So here are two tables. * The data come from an official source: The Korean Statistical Information Service. 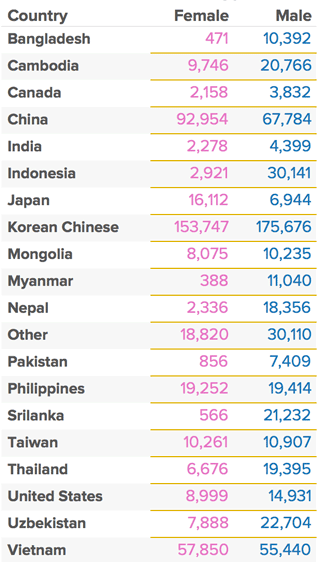 But it’s unclear what “registered” foreigners means — it’s not included in the metadata — and some foreigner totals differ. ** I live across the street from Yongsan Garrison, headquarters to the roughly 28,000 American forces stationed around the country. The troops there obviously aren’t included in South Korea’s immigration figures.